Fort Wayne is often called "The City of Churches," and for good reason. A search of the skyline reveals many steeples and domes that reflect the religious faith of local residents. Religious worship has taken many different forms. Some congregations worship in ornate settings in edifices that are more than a century old; others worship in newer or more simplified settings. Occasionally, a congregation will redecorate the interior of a church and discard items of historical significance. Some of these artifacts have found their way into the collection of the History Center. One item of significance on display in one of the main floor galleries is a painting from the former reredos of Trinity Episcopal Church, located at 611 West Berry Street. A reredos is a structure, usually of wood or marble, that is placed behind the altar of a church. They are found commonly in the Catholic, Lutheran, and Episcopal churches, and also in other denominations. Sometimes they contain paintings or carvings of religious significance, and many versions in Europe are of medieval origin. Trinity Episcopal Church was founded in 1844, and its present edifice was completed in 1866 - a Gothic revival building designed by architect Charles Crosby Miller of Toledo. The interior has undergone a number of redecorations in its history, including one in 1893, another in 1925, and several others in more recent times. In 1925, Trinity's rector, Rev. Louis Rocca. commissioned the New York architectural firm of Bertram Grosvenor Goodhue and Associates to redecorate the nave in a colorful style that resembled a fifteenth century European church. (The firm had recently completed the design of Trinity English Lutheran Church nearby). The old Victorian stenciling on the walls were replaced with deep shades of red, blue, and gold, and much of the old varnished woodwork was repainted. The centerpiece of the redecoration was a new painting for the reredos, replacing an earlier painting of Jesus as the Good Shepherd. Bertram Grosvenor Goodhue commissioned a pair of New York City artists, Telford and Ethel (Parsons) Paullin, to design a new painting. The Paullins had worked with the firm before and were well known. Telford Paullin (1885-1933), a native of Le Mars, Iowa, had studied art in Chicago before coming to New York City. He and his wife Ethel became captivated by Byzantine art as it appeared in Eastern Orthodox churches, and they adapted it to their own style, which they exhibited in many churches, especially in the East. 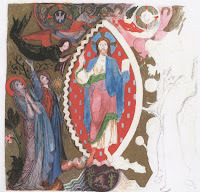 Several years earlier the couple had painted a series of medallions in Byzantine style for the Chapel of St. Bartholomew's Church in New York City, as well as other works of art for the Church of St. Vincent Ferrer. Ethel was known both for her painting and her design of original tapestries. Both had experience painting murals and frescoes. Telford painted a colorful series of paintings comrpising the Stations of the Cross. The painting created by the couple for Trinity Episcopal church depicts Christ in the sacred role of priest. He holds the Bible in his left hand, and his right hand is giving a traditional blessing. He is surrounded by a group of angels and saints, including St. Mary the Virgin on the far left. 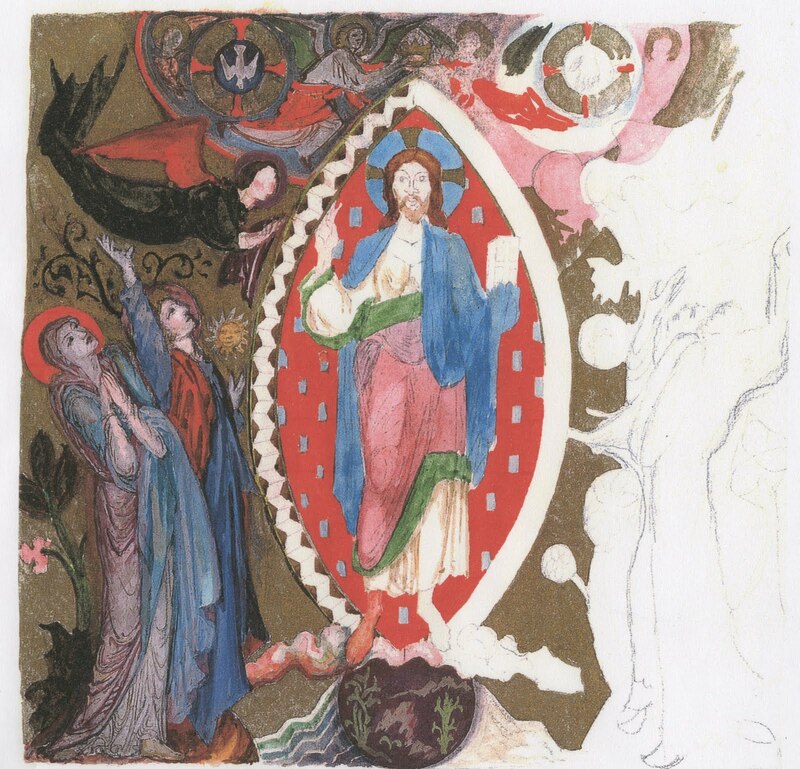 The Paullins prepared several studies and watercolors of the painting before completing the final version, and copies of these studies are housed in the Trinity Church Archives. When the painting arrived, Father Rocca wrote Mrs. Paullin a letter of thanks, praising the work as "a source of constant joy." He added: "The wealth of sympolism you have imbedded in this painting, and the happy choice of color combinations - in fact, your exquisite and masterful treatment of the whole subject - make the painting one which is thoroughly unique, and most precious indeed. It blends in admirably with the general tone of our Fifteenth Century Gothic decorations, and is, as it should be, compelling to the eye the moment one enters the Church." Some parishioners disagreed about the scale and cost of the decorations. Many agreed that the painting was better appreciated up close, where its minute symbolism could be carefully studied, than from a distance. When the church underwent another redecoration in 1962, the old reredos was removed and a new one installed. The painting found its way into the History Center collection, where it remains on display. Religious artifacts teach us much about the diversity of Fort Wayne's spiritual heritage. When viewing them, one sees both the commonality and divergence of that experience. It is fortunate, indeed, that items once cast away by a congregation can find a new home in the Museum.